Housing Market in the Valley Continues to Strengthen! 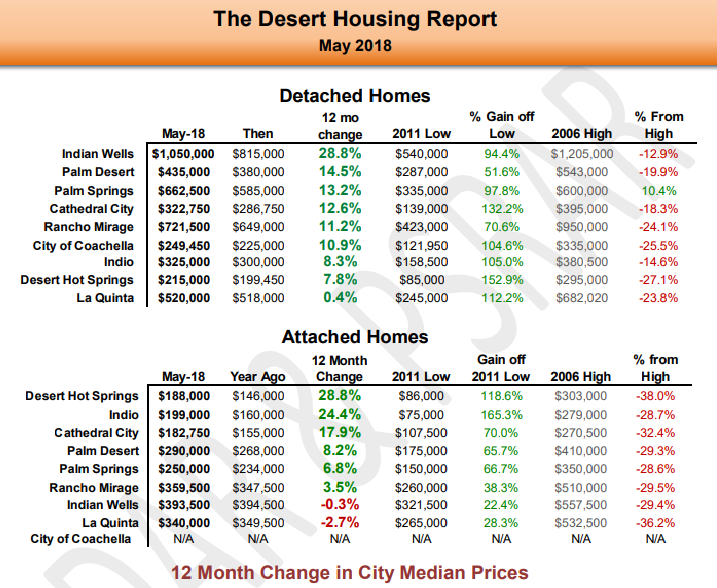 We are pleased to announce that the May Desert Housing Report shows that the median price for the entire Coachella Valley continues to rise! As you can see from the chart below, the market is definitely on an upswing. For detached homes, all nine cities show positive year over year price changes. This is the first time this has happened in two years and reinforces the conclusion that the housing market in the Valley continues to strengthen. Two cities, which have been lagging price wise for the last two years - Indian Wells and Palm Desert - now show the highest year over year gains of 28.8% and 14.5% respectively. Please reach out to us with any questions you have! The numbers only tell part of the story, and it's our years of experience and professional eyes that can help guide your decision making process. Don't hesitate to call!